I often come across large ERRORLOG mainly because they are not being recycled frequent enough, or not at all. Sometimes, despite the frequent recycling, the ERRORLOG can grow to unmanageable size. This has recently happened to me during a large transaction rollback over Synchronous Availability Group. Within a few hours, the ERRORLOG log grew to 5GB in size due to “Sending page request for Undo” messages. The rollback was triggered by the primary node failure during an insert of 800 GB into a partitioned table. The failure caused the primary node to reboot, triggering failover to the secondary replica and, of course, after the now secondary node came back up, the rollback started. 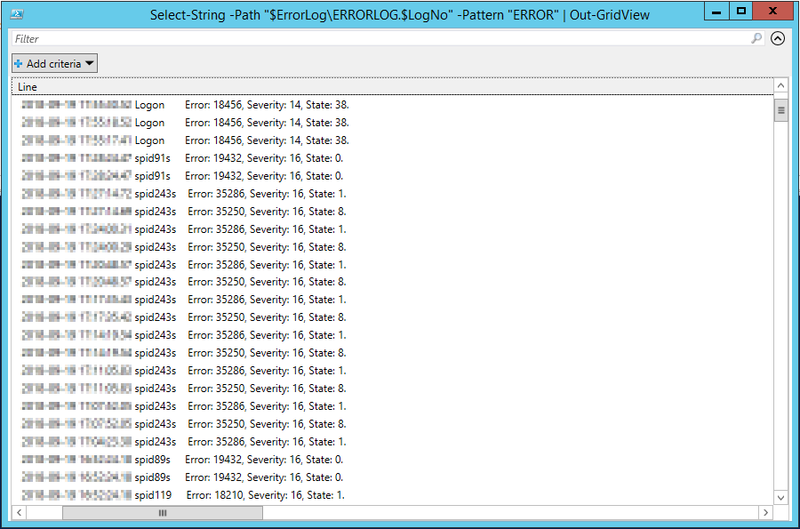 At that point, I really needed to see what errors and failures were being registered in the ERRORLOG during the service recovery, which proved difficult. The out of memory exception is caused by the amount of data returned back to the client. We have to be more clever. Let’s stop the loading right after opening the viewer using the “Stop” button on the top bar, apply the filter and then hit “Refresh”. This should return fewer rows and will work…, right? Not much luck either. Let’s look into alternative ways. 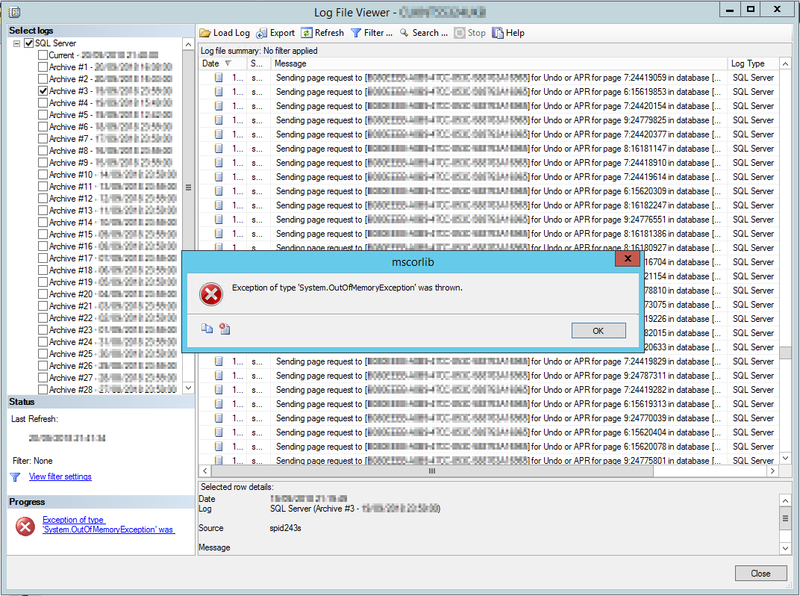 So, what better alternatives do we have to get a sensible information out of a large log file? 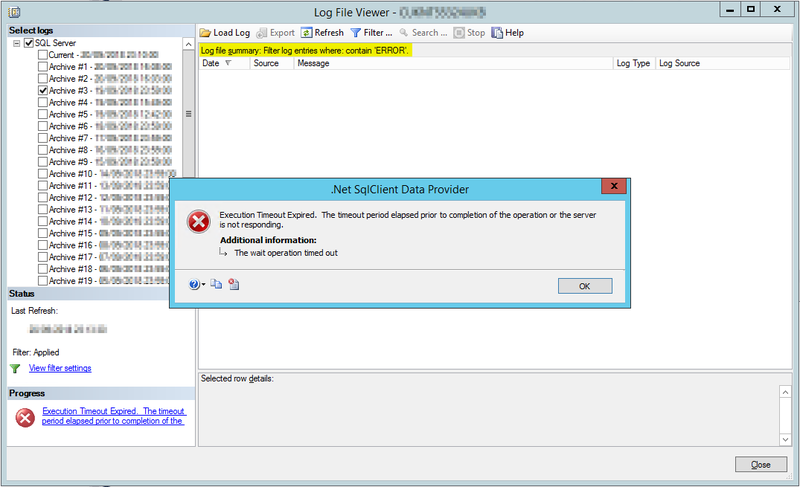 $SqlServer = new-object Microsoft.SqlServer.Management.Smo.Server  "localhost"
The slow performance is caused by the fact that it has to iterate through all the rows in the 5GB file to find those matching our ERROR filter. 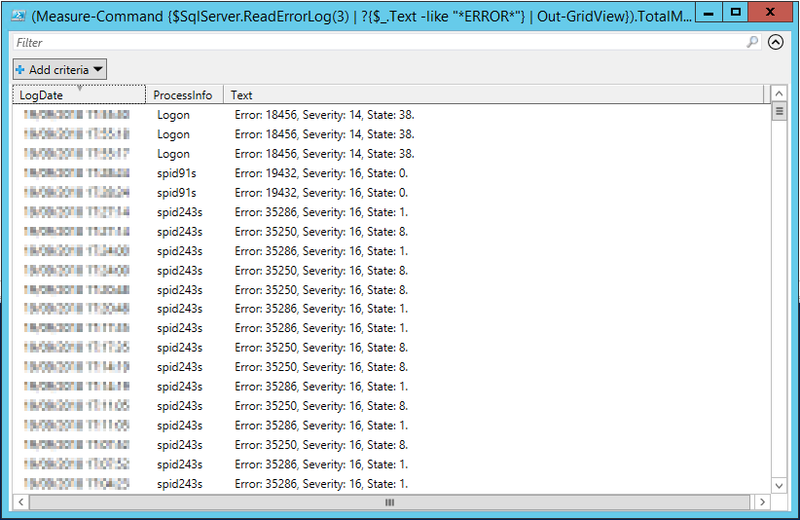 This is bound to be slow and the result is the same as in the T-SQL example above. The ERRORLOG is a text file sitting on a local disk in the Log folder. We could open it in notepad but that’s not a very convenient way to be searching through lots of lines of text. 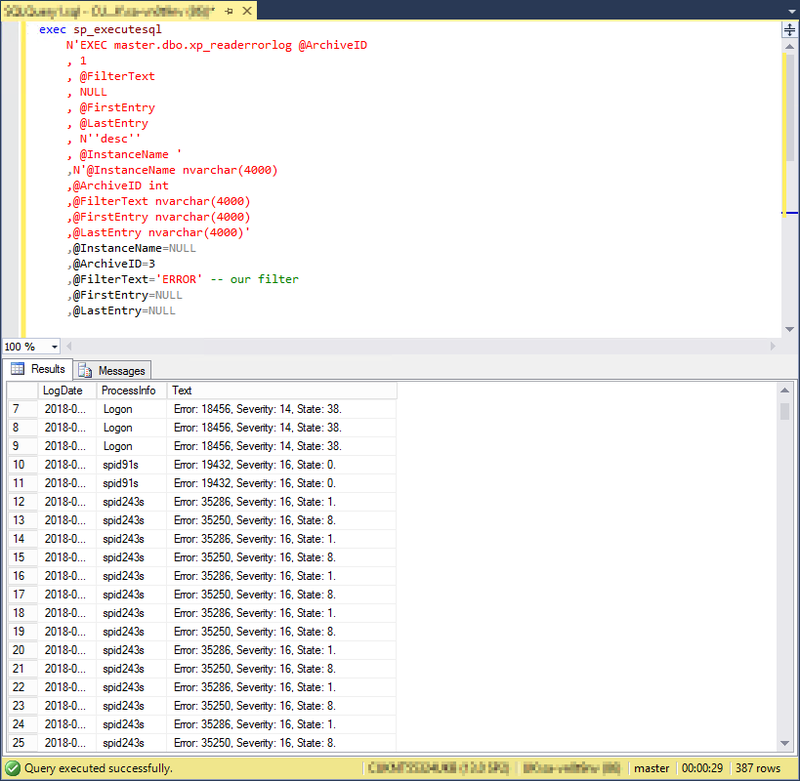 We can also use PowerShell to read a text file using a highly efficient Select-String function. In this case, the GridView opens instantly and continues loading filtered data in the background. In all earlier examples, we had to wait for the data set to be filtered and returned to us, in this example, we have access to the first filtered rows immediately! > 4115:2018-02-18 16:23:33.38 spid75s     Error: 35286, Severity: 16, State: 1. 4116:2018-02-18 16:23:33.38 spid75s     Using the recovery LSN (1536:50088:1) stored in the metadata for the database with ID 14. This is an informational message only. No user action is required. > 4127:2018-02-18 16:23:33.82 spid212s    Error: 35286, Severity: 16, State: 1. 4128:2018-02-18 16:23:33.82 spid212s    Using the recovery LSN (2702:305880:1) stored in the metadata for the database with ID 35. This is an informational message only. No user action is required. > 4860:2018-02-18 16:23:37.96 spid201s    Error: 35286, Severity: 16, State: 1. 4861:2018-02-18 16:23:37.96 spid201s    Using the recovery LSN (519:448856:1) stored in the metadata for the database with ID 18. This is an informational message only. No user action is required. > 4945:2018-02-18 16:23:38.07 spid37s     Error: 35286, Severity: 16, State: 1. 4946:2018-02-18 16:23:38.07 spid37s     Using the recovery LSN (1553:351536:1) stored in the metadata for the database with ID 20. This is an informational message only. No user action is required. > 4966:2018-02-18 16:23:39.07 spid236s    Error: 35286, Severity: 16, State: 1. 4967:2018-02-18 16:23:39.07 spid236s    Using the recovery LSN (31538:188792:1) stored in the metadata for the database with ID 21. This is an informational message only. No user action is required. The winner in performance and functionality category is the Select-String function taking just over 20 seconds to find matching rows in a 5GB file, with the native T-SQL taking just under 30 seconds to do the same and the slowest being the SMO method taking over 17 minutes! Reading ERRORLOG as a plain text may not be the easiest way and has its limitations. For example, it will only work on a localhost unless we get access to the remote ERRORLOG via UNC path. However, it is definitely the most efficient and the most flexible way, especially if you have big files that you’d like to run some regular expression on.